As with a lot of products, 2012-13 Upper Deck Black Diamond Hockey has some hits that are easier to find than others, even within the same insert collection. And while some of the biggest stars are among the toughest pulls, this isn't always the case. Upper Deck has confirmed the following 2012-13 Upper Deck Black Diamond Hockey short prints for both the Gemography autographs and Double Diamond Jerseys sets. We've included both the grouping odds and calculated how tough it is to pull an individual card from that group. 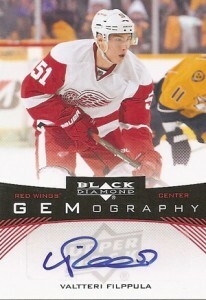 2012 13 BLACK DIAMOND GEMOGRAPHY STEVEN STAMKOS TAMPA GROUP A 1:3813 PACKS RARE!